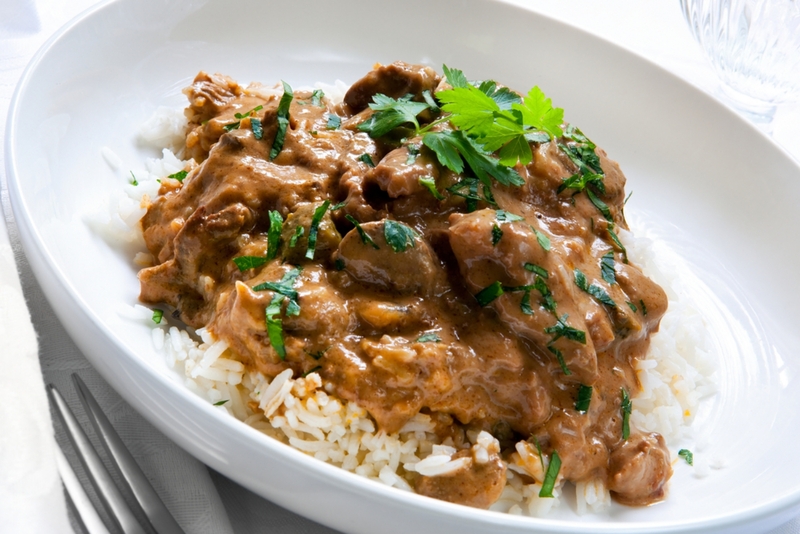 Another great weeknight meal for the family to fall in love with, Brazil’s rendition of Beef Stroganoff is just as delicious and simple to throw together as the classic comfort food that warmed our bellies, growing up. However, this mouth-watering version introduces some totally yummy twists, like the addition of tomato puree and Dijon mustard. Be forewarned, this sauce is dangerously addicting! Traditionally, this Brazilian dish is served over white rice beside a pile of piping hot shoestring fries, but we chose to cut some of those calories and just nix the fries. This dish shines brightly all on its own! We also veered a little from the original recipe by swapping out the heavy cream for plain yogurt, just to add a bit more of that tasty tang. Man, was that a good idea! Everyone in our house agrees that this dish is just as delectable and comforting as the old tried and true stroganoff (if not more so!) and requests it on a regular basis! Mix flour, smoked paprika, cayenne and salt In a large bowl and add meat. Mix around with your hands, making sure every piece of meat is coated with the seasoned flour mixture. Heat olive oil and butter in a large skillet, on medium-high, add mushrooms and cook until golden. Add the seasoned meat and cook until barely browned, then stir in onions and cook until slightly golden. Add beef stock and scrape up any bits stuck to the bottom of the skillet with a wooden spoon or spatula. Let it come to a simmer and reduce heat to medium-low. Add Dijon mustard, tomato puree and Worcestershire sauce. Cook about 5 minutes and remove from heat. Stir in yogurt until well combined. Serve over white rice, garnish with fresh parsley and enjoy!